Background: DRB is a specific inhibitor of casein kinase 2 (CK2, IC50 = 6 µM) and casein kinase 1 (CK1, IC50 = 14 µM). It is also a specific inhibitor for RNA polymerase II transcription in vivo and in vitro whereat the effect on RNA polymerase II-specific transcription seems to be mediated by its inhibition of nuclear casein kinase 2. 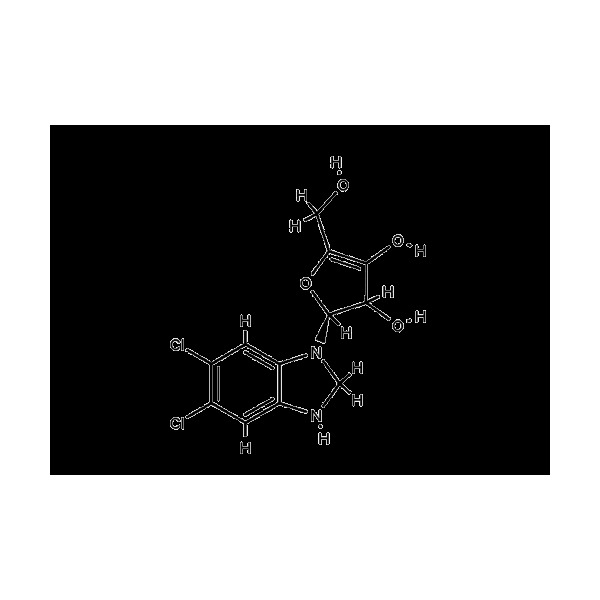 DRB is a competitive inhibitor in respect to its phosphate donor substrates ATP and GTP. Zandomeni R, Weinmann R. (1984) "Inhibitory effect of 5,6-dichloro 1-beta-D ribofuranosyl benzimidazole on a protein kinase." J. Biol. Chem. 259(23):14804-11. Zandomeni R, Zandomeni MC, Shugar D, Weinmann R (1986) "Casein kinase type II is involved in the inhibition by 5,6-dichloro-1-beta-D-ribofuranosylbenzimidazole of specific RNA polymerase II transcription." J. Biol. Chem. 261(7):3414-9. Zandomeni RO (1989) "Kinetics of inhibition by 5,6-dichloro 1-beta-D ribofuranosyl benzimidazole on calf thymus casein kinase II. "Biochem. J. 262(2):469-73.